Nothing compares to the aroma of freshly baked flapjacks drifting throughout the house or apartment in my case. Flapjacks are very easy to make and eat! They are great to share with family and friends. I liked mine topped with COYO (yogurt made from coconut milk) or ricotta. This recipe is gluten-free using gluten-free oats; you could also try quinoa flakes (sold in Lulu Hypermarket). I used a blend of honey, natvia and raisins to sweeten. Also I added lemon oil and zest for the lemon zingy flavour but you can change this to suit your taste buds. You can play around with flavours depending on your palate. Vanilla whey protein powder would be a good addition to boost the protein content but always remember with treats moderation is key. Gluten free oats, natvia, chia seeds and sesame seeds – Organic Supermarket Nations Tower. Lemon oil and vanilla pod – Central Souk beside World Trade Mall. The spice shop beside Nab Juices. Raisins, pumpkin seeds and desiccated coconut – sold in any supermarket. Sun-maid is my favourite brand as there are no added ingredients, just raisins. COYO yogurt – I am addicted to this!! It is a vegan creamy coconut yogurt; you can find it in Carrefour in Marina Mall. Preheat oven 180°c – baking time 20-25 minutes depending on oven (they should be golden brown). Measure & Mix: measure out and pop in a large mixing bowl oats, chia seeds, desiccated coconut, sesame seeds pumpkin seeds and raisins, stir to combine. Melt: in a small saucepan on a low heat (just enough to soften, not boil) add honey, natvia, olive oil, vanilla, lemon zest and lemon oil. Gradually stir until it has a runny consistency. Pour: over the flapjack mixture and stir until evenly coated and the mixture has a sticky appearance. 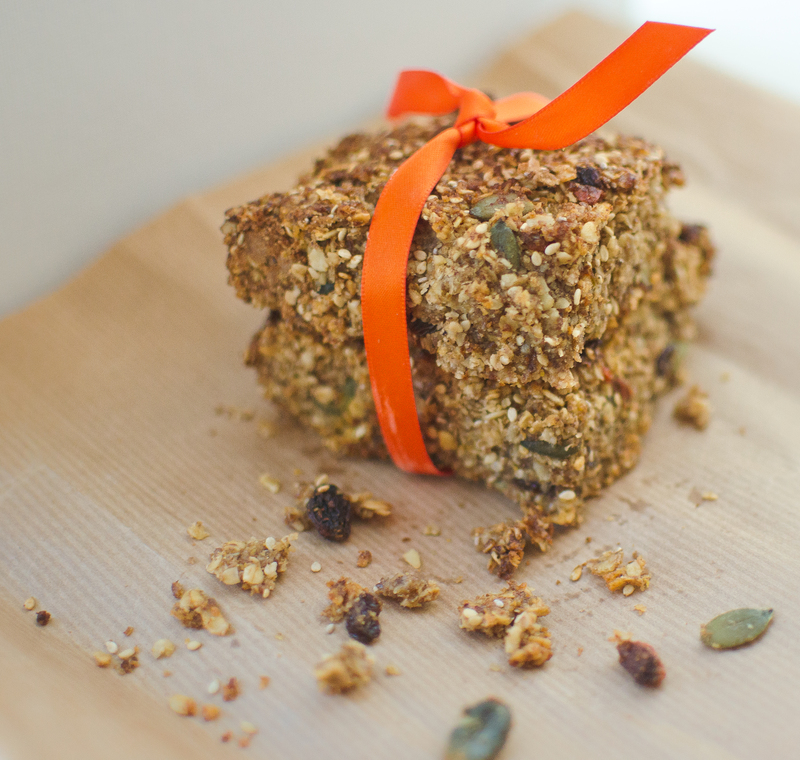 Pop the flapjack mix onto a baking tray and level it off, I used a square one or a round tray would work perfectly too. Bake & Cool: baking for 20-25 minutes until golden brown. Remove and allow to cool before cutting. Sometimes I am an eager beaver and cut before they are cool; they have a tendency to crumble. The cooling allows them to set.